NAVITEL® releases an update of Navitel Navigator 9.10 software for devices running on Linux. The latest update includes optimized route building for trucks and large vehicles as well as enhanced 3D objects. Media Player feature is introduced in the release. Linux software ensures prompt and reliable operation of Navitel Navigator software. Flawless security of the firmware increases the performance period of a personal navigation device. 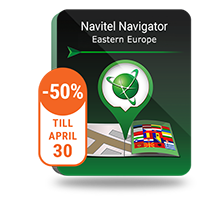 Navitel Navigator 9.10 allows for quick route building for any type of transport. Drivers of larger vehicles can build and choose an optimal route before the trip in order to save time during the drive and make it more comfortable. When choosing alternative routes (in the lower right corner of the display). When choosing navigation in 3D mode, three-dimensional objects from across different countries will be displayed on the screen. Thanks to the realistic design of the models it is easy for any driver not to get lost or confused even in unfamiliar areas. Navitel Navigator 3D objects database includes heritage landmarks, museums, sport grounds, main and other significant monuments. The latest software update allowed extending the device functionality – Media Player feature is added to the setting of any Linux device. With its help one can enjoy favourite music tracks via the device loudspeakers, with earphones or through car acoustics by tuning in the FM transmitter. In order to transfer your music to the navigator, simply add music files to a microSD card and insert it into the PND. To download the update please use our free utility Navitel Navigator Update Center. With this tool you are just a few clicks away from installing the new software version, maps, and the SpeedCam database. Please read the full instruction on our website.